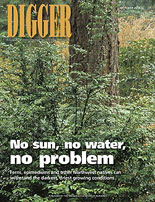 Ferns, epimediums and other Northwest natives are just a few of the plants that can withstand the darkest, driest growing conditions (PDF), as featured on the cover of the new issue of Digger magazine. “A new crop of leaders” (pdf) — These young guns of Oregon’s nursery industry represent the future. “The best/worst time for pathogens” (pdf) — New, weather-driven risk models indicate when box blight and apple scab are more likely to spread. “Conversation-piece plants” (pdf) — Garden columnist Mike Darcy picks the plants that will get people talking. “The plan before the plants” (pdf) — To make money in a post-recession economy, a good production plan is vital. “Oregon at a crossroads” (pdf) — OAN Executive Director Jeff Stone outlines the reasons why voting yes on Measure 88 is crucial for the state’s economy.